Whether it was a franchisor's revitalized website or an ongoing "How can we do better?" philosophy, the winners of this year's STAR (Speaking To And Responding) Awards represent the best in franchise recruitment. Mystery shoppers contacted franchise brands to evaluate their performance in telephone follow-up, website response, franchisee satisfaction, and social media. 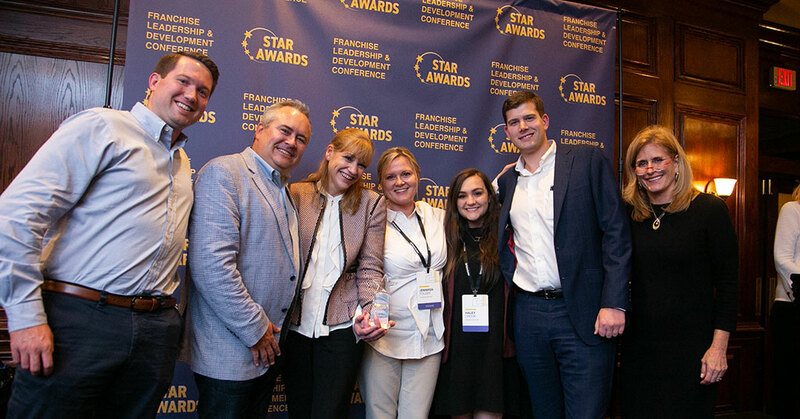 The hard work of the best performers was recognized with STAR Awards at a banquet on the final night of the 2018 Franchise Leadership & Development Conference (FLDC) in Atlanta. The awards dinner, sponsored by ApplePie Capital, was held at Maggiano's Little Italy, a short walk up the road from the InterContinental Buckhead, where the conference was held. To learn more about the methodology employed by the mystery shoppers--and more important, their observations, analysis, and suggestions for improvement--see page 40. The full list of winners and top runners-up appears at the end of this article on page 48. So how did the winners do it--and what can your brand learn from them? This year's first place STAR Award honorees share their thoughts on their winning strategies and tactics for outstanding performance in 2018. Josh D'Agostino, executive vice president for sales and business, knows that promoting a wholesale franchise is a tougher sell than the retail variety. When he joined Mighty Auto Parts two and a half years ago, lead flow numbers were dismal: just one or two per month. He kicked off a complete overhaul of the website--and everything else in the franchise recruitment process. The website now includes "all those phrases people are looking for, and links and videos--all those things that search engines tell you help people find you," says D'Agostino. "We have done a good job, but there's always a better way." Raising the quality of the website's content was also essential because automotive aftermarket parts are not that dynamic, he says. "We are technology-savvy, but the actual business is pulling parts off the shelf." The revamp has significantly improved recruitment response: the company is now pulling in 10 to 12 leads monthly. When Barbara Schuh, vice president of franchise operations, analyzed two years of leads, she discovered that the time and money being invested were not as effective as they could be--or as she liked. "We were leaving good leads on the table because we weren't getting to them," she says. "We needed to make sure we treated every lead as the most valuable one we would ever receive." That type of singular attention made a difference. In recent reviews of recruitment data, says Schuh, the brand has surpassed all previous years' recruitment categories by 3 to 5 percent; and interviews of 50 franchisees by a third party told her that the brand had also greatly improved in this key metric. This kind of feedback, she says, "means our franchisees really believe in our systems and our support. They are our customers and we are there to deliver the best quality service within our culture of caring. They, in turn, do the same for their clients." This year, she says, Home Care Assistance began a campaign to educate its franchisees on the brand's key differentiators--sharing the "beautiful stories" that highlight the franchisees' work toward making a difference in the lives of both caregivers and clients. Wild Birds Unlimited is a regular STAR Award winner, and this year was no different: the brand also was Runner-Up for Best Overall Responsiveness. Chief Development Officer Paul Pickett, who served as chair of this year's FLDC, believes the brand's excellence springs from its "How did we do?" culture. Not only do the franchise's employees ask that question, he says, they also ask each candidate, "How could we do better?" One example is the daylong formal approval visit for franchise candidates. Asking that second "how" question told Wild Birds that it might be helpful for candidates to have a document with information that included answers to frequently asked questions and suggestions about what candidates could do to make the best use of that day. With those changes, Pickett says, "We've seen candidates be better prepared." Wild Birds also asks candidates what most inspired them in the brand's marketing material. After winning the award, Pickett followed up with the STAR Award mystery shopper to find out where the brand might improve even more. What's characterized the most recent version of Learning Rx's website is its responsiveness to change. LearningRx, which started in 2002, offers one-on-one brain training and cognitive skills improvement programs. Keeping up to date in a field where research has grown tremendously since the brand's early days is an absolute requirement for success. "We self-evaluate every year, and we're opening ourselves up to growing after being on hold while we did the research needed for brain training," says Tanya Mitchell, chief research and development officer. The brand now has much more information to share with franchisee candidates, including randomized control trials that LearningRx has been involved with, along with testimonials from clients highlighting their own improvements through the programs they've taken. The published research, Mitchell says, "makes it easier for us to talk with our franchisees, a lot of whom feel a calling." The website now features many more videos from customers telling tell their stories of how the training has worked for them. Often, says Mitchell, people say, "I need to see it." With 1,000 franchises launched, Smoothie King has honed its website into a tool that's precise and well organized. "We have a calendar and a schedule for what we're going to post and we review it every quarter," says Kevin King, chief development officer. "We create content that's relevant to the time of year and to the company. The other thing that's important to our website--and that people often miss--is communicating with people in the different ways that they learn. We created a resource page that serves people who may not want all the details, but who don't want to feel as though they have to jump through hurdles to get certain information. I've encountered so many people in franchising who think everybody wants everything. What we try to do is make sure people are aware that we have extensive resources on our website, without intimidating them." King also appreciates how much more he can share with franchise candidates today--and how much less it costs to do so--than decades ago when franchise candidate packages would be mailed out. "Today, all that is at my fingertips on our website." "We were delighted to earn this recognition," says Chief Brand Officer Steve Schildwachter. "It makes sense, though, for a couple of reasons. First, in the kind of business we're in, people usually need help right away, so fast response is ingrained in the culture. Second, our whole reason for being is to help improve people's lives--and that extends to franchising, where we see our mission as helping make people successful." BrightStar Care also acts on its mantra of continuous improvement, he says. "We run a tight ship when it comes to marketing, and that includes development. Our franchising website was already converting visitors to leads at a rate above the industry average, but we kept optimizing, A/B testing the response mechanism, and rotating content to find the best franchisee testimonials to the strength of our model." Last year, Vice President of Franchise Development Ron Bender was a one-man development team. "The benefit was that I had total control," he says. The downside was his inability to return phone calls within the time frame he knew would be most effective. "The question was how we could reach out to candidates before anyone else did," he says. "They are clicking on four or five other sites at the same time." This year, his newly augmented team decided the goal would be a text message within 15 minutes of an inquiry and a phone call within an hour. Even though a surprisingly large percentage of people still don't have anything but a land line, Big Frog's percentage of conversion from portal leads increased by 22 percent with Bender's text-based response approach. But he also learned a good lesson this year after an upgrade to email dispatching software proved deceptive. It was showing that informational emails to franchise candidates had been sent and delivered--but the delivery part wasn't actually happening. Bender found out about the problem after a particularly eager candidate called to say he hadn't received the email. "You have to be prepared to do it yourself," says Bender. "This award is a huge honor for us," says Jen Chaney, vice president of franchise development. "We are a Midwest-based drive-thru coffee franchise that had very little social media presence in development in years past," she says. "When we partnered with our marketing agency, they took over all the management and content creation for our platforms, including images and video that support the visual quality of our brand. With their content and expertise on targeted advertising, we have seen an increase in leads this calendar year." That increase was also aided by the franchisees and corporate staff, she says. "Scooter's Coffee is a large community, and the engagement we see on our posts can be directly linked to the company involvement. We also make sure that we take our PR success and immediately turn it into content to share on our development social pages." She says sharing that news helps to send the brand's story to the largest audience possible. "We recently were part of a feature in the Wall Street Journal, a media outlet with worldwide reach. Being able to share that content on our social channels truly is invaluable." Franchise Update Media's annual STAR Awards are a recognition of excellence by franchisor recruitment and development teams. There are many players, but only the best take home the trophies.